This blog has suffered greatly these past couple of weeks, as professional demands, as well as lack thereof, have taken a toll on my writing schedule. Translated, that means that after working like hell for quite a while, I went on an eight-day vacation and didn’t write a line. Seldom do I vacate for eight entire days, but this year was an exception, and although I did not travel far (only 125 miles up the Florida coast), I was officially, ‘away’, and when I am ‘away’ I try not to touch a computer keyboard. This year I almost made it through without touching fingers to keys, and if it were not for the need to post an item for sale on Craigslist, I would have succeeded in keeping my vacation ‘computer free’. I also try not to watch too much network news. I mean is there really any need to be completely informed on all matters at all times. Since there is little threat these days that ‘The Big One’ will be dropped on us at any time, I see no need to stay connected to international affairs 24/7. I recall reading a Civil Defense book that we had in our home when I was a child. I remember the chilling photos of the mushroom cloud rising over a distant city, as a family hunkered down in their well stocked fallout shelter, hopefully safe from annihilation in a wake of a gazillion megaton nuclear blast, that in reality would have vaporized them along with their supply of canned tomatoes and bottled water. This particular Civil Defense guide went on to suggest that farmers take transistor radios to the fields with them during times of international tension, in order to monitor unfolding events. Presumably, they would be able to get the tractor tucked safely in the barn, should a flight of ICBMs be tracked coming in over the pole. Ludicrous indeed. 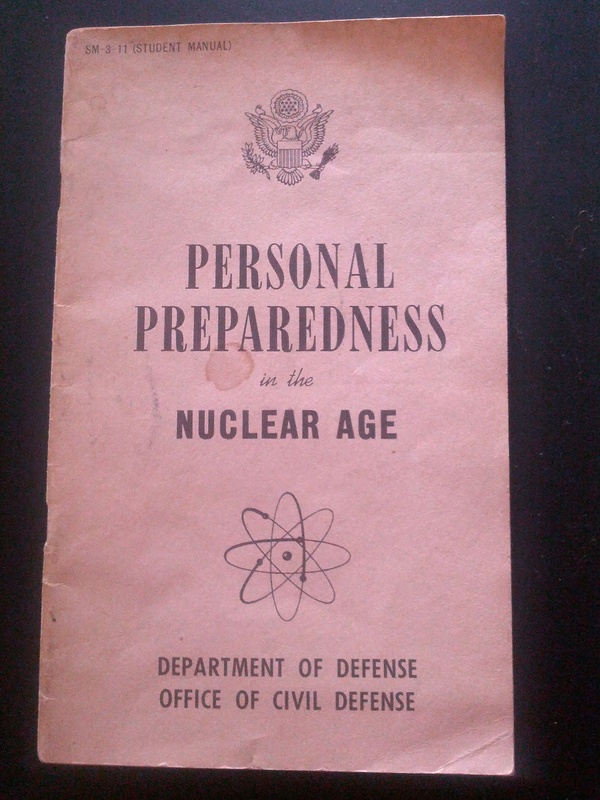 As time went on, and the sixties unfolded into the seventies, these Civil Defense guides disappeared as we all accepted the grim reality that in event of such a man-made doomsday, there would be few, if not, any survivors. Today, we seem to have little to fear from sudden and complete annihilation of the North American continent, however, our lives seem to be no more or less safe from destruction by events beyond our control. The Orlando, Florida television stations, in the beachside community where I spent last week, preempted local news in lieu of live coverage of the George Zimmerman trial. Zimmerman, the armed community watch volunteer who seemed to go prepared for trouble, found it, and dealt with it using deadly force, is on trial for (what is effectively) his life. Meanwhile, the distraught family of the unarmed teenager felled by his bullet plead for justice. So it is a dangerous world, where walking in the wrong place, at the wrong time can mean deadly consequences. We are an armed nation, and there are lots of people packing heat and not afraid to use it – or maybe they just use it if they are afraid, who knows. Fortunately, this trial is coming to a head, and shortly justice will be served – hopefully. Word of the tragic death of 19 Arizona firefighters came to me not over a network news station, but via The Weather Channel (TWC), as I tuned in one morning to ascertain whether or not the line of storms off of the Atlantic coast was a threat to the day’s fishing. I immediately turned to an NBC news report, delivered over my phone. Finally, the crash of an airliner in San Francisco distracted me from fishing and beach. As I paused to think for a moment about the two young girls who lost their lives in this ‘routine’ flight, and to consider how vulnerable we all are as we shoot through the skies from city to city aboard a mode of transport deemed safer than driving. Unlike the crash of the commuter plane in Buffalo a few years ago, in which the experience of the pilots is coming into question, this jet from Korea to the US had four pilots aboard for this long-haul international flight. The fact that it could crash upon landing, on a clear day, after making a successful flight across the Pacific Ocean is beyond belief. The cause of this crash will take aviation experts, of which I am not one, months to investigate before a cause is determined. What I do find interesting is the news media’s continuing disbelief that the shaken passengers took time to gather personal possessions (even duty-free bags), before exiting the burning aircraft, as if these oblivious survivors put Ipods and scotch above human life as they malingered to gather earthly possessions. More than likely, these passengers were is shock in the few minutes immediately after dropping onto that San Francisco runway. I wrote a bit about this several years ago in an article about surviving a plane crash. You can read it here if you like. So that’s it for now. Vacation is over, and I am back working and blogging. I am thinking about the fragility of life. As a new tropical disturbance crawls through the Caribbean I find myself thinking of how quickly our situations can change. If we are alive and relatively healthy we should consider ourselves lucky.